The St. Mary’s County Sheriff’s Office has named Marvin Butler as the department’s new chief of staff. Mr. Butler, a native of St. Mary’s County, has more than 30 years of law enforcement experience with the Charles County Sheriff’s Office, where he reached the rank of major, as assistant sheriff of operations. 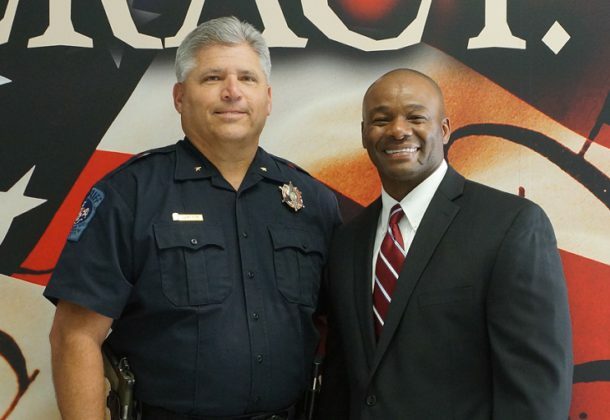 As chief of staff for the St. Mary’s Sheriff’s Office, Mr. Butler will administer the civilian staff of the agency, including the offices of finance, human resources, police services, records, and property. At the Charles County Sheriff’s Office, Mr. Butler was commander of the Patrol Division, commander and investigator in the Office of Professional Responsibility, Supervisor of the Warrant/Fugitive and Domestic Violence Unit, supervisor of pre-employment/background investigations, supervisor in the Patrol Division and served as the team leader and member of the Emergency Services Team for 12 years. Mr. Butler was twice the Governor’s Awards Recipient in Crime Prevention for exceptional commercial and residential field service, was the Charles County Sheriff’s Office recipient of the first-ever Gold Medal of Valor during a lifesaving incident involving a fellow officer in 1997, and was also named the Maryland Sheriff’s Deputy of the Year in 1997. Mr. Butler earned an associate degree in criminal justice from the College of Southern Maryland, is a 2010 graduate of Northwestern’s School of Police Staff and Command, and is a 2012 graduate of the FBI National Academy.